The President announced his support today for corporate tax reform that reduces the rate to 28 percent by eliminating expenditures in the tax code, deductions, credits and the like. Ostensibly this reduction is a show of goodwill and a step forward. Yet under closer scrutiny, the President’s proposal hypocritically reinforces existing tax expenditures and fails to meet the expectations set by his own Fiscal Commission, Simpson-Bowles. The bipartisan Simpson-Bowles Commission outlined three basic measures to improve the corporate tax code and reduce deficits. 1) Establish single corporate tax rate between 23 percent and 29 percent. 2) Eliminate all tax expenditures for businesses. 3) Move to a competitive territorial system. In the President’s business tax reform framework released today, the President pinpoints the problem, “Tax expenditures and loopholes in the U.S. tax system, together with the structure of the corporate tax system, produce significant distortions that can result in a less efficient allocation of capital, reducing the productive capacity of the economy and U.S. living standards.” But the President does not call for the elimination of all these loopholes and expenditures, as his Fiscal Commission did. Instead, he continues to handpick industries to benefit from government largesse in the form of tax credits and deductions and fails to champion any of the three Simpson-Bowles recommendations on business tax reform. 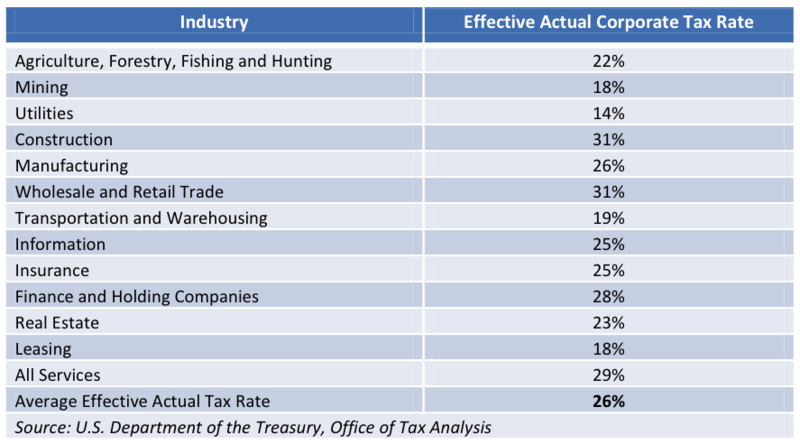 The President used the following chart to decry the unevenness of the U.S. corporate tax code depending on industries. Yet, the President’s framework does not even superficially pretend to even out these rates. His five measly examples of tax expenditures up for the chopping block target only a select few industries: oil and gas companies, the insurance industry, hedge fund managers and other financial companies, and buyers of corporate jets. Coincidence or election-year politics? While the President has proposed eliminating these expenditures, his plan promotes and expands others that advance his own agenda. His plan includes: a reformed and expanded health insurance tax credit for small businesses (originally included in the Affordable Care Act), expanded renewable energy tax credits, a new 20 percent income tax credit for the expenses of moving operations back into the U.S., a permanent and expanded research and experimentation tax credit, and a reinforced domestic production activities deduction to aid American manufacturing. While few people would argue against having a booming renewable energy sector or a vibrant manufacturing sector, there is an underlying hypocrisy in proposing the elimination of tax expenditures under the banner of reduced complexity and inefficiency while simultaneously adding new complexity, creating new inefficiencies and reinforcing some old. Simpson-Bowles proposed the elimination of all expenditures because it is far too easy to insert special provisions that only help some sectors of the economy. As the President says before laying out his framework, “Tax preferences created by tax expenditures and loopholes add complexity to the tax system and contribute to a substantial business tax compliance burden.” This plan, or “framework,” would contribute to that problem. This discussion has been a long time coming. From the Simpson-Bowles recommendations to the plan put out last year by Rep. Dave Camp (R-Mich.), some consensus exists on how to approach these reforms. Months ago, Douglas Holtz-Eakin, President of the American Action Forum, explained why our high corporate tax rate diminishes the competitiveness of U.S. companies and their ability to hire more workers. The combined rate of state and federal corporate taxation in the U.S. is second highest of all OECD countries, soon to be highest, with a statutory rate of 39.2 percent in 2011. The current code is a drag on our economy. The need for pro-growth corporate tax reform has been widely acknowledged. Yet, the President’s plan is the typical mix of some policy and a lot of election-year politicking. Instead of a move towards a territorial system of corporate taxation that many say will enhance global competitiveness, the President vaguely proposed a minimum tax on overseas profits. Moves away from Simpson-Bowles and other bipartisan proposals are not indicative of someone trying to build a coalition of support or even tacit consensus. In his briefing today Press Secretary Jay Carney said, “This is an area where an opportunity exists to disprove the convention wisdom that nothing can get done in an election year.” Yet, if corporate tax reform is going happen this year, the President is signaling to Congress with this plan that it will not be a result of his leadership. He punted, again. Tags: corporate tax reform, President Obama, Tax reform. Bookmark the permalink. Previous post ← How About an Afternoon Tea Party?